Escapades is another label new to me. A partnership from Greece have bought a small farm in the Bottelary Hills and constructed a winery to make 70,000 bottles of four premium Estate grown varietal wines. I met Stelios Samaras at the London International Wine Fair who told me that the Escapade winery had been set up by winemakers Evangelos Gerovassiliou and Vassilis Tsaktsarlis with marketeer Takis Soldatos, whose Mare Magnum company makes wine in Italy and six other countries. Maceration and fermentation was in stainless steel tanks for 10 days at a relatively low temperature ranging from 20-25°C. After malolactic fermentation the wine was matured for 12 months in 100% new French Allier oak barrels before bottling and undergoing bottle aging. 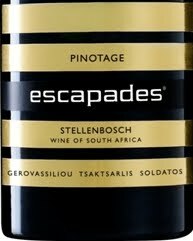 The 2008 Escapades Pinotage is good example of the variety with some lush ripe fruits and it is pleasant drinking but I thought the pricing – not finalised but they expect it to retail northwards of £25 - to be rather ambitious for the first vintage from a new label.